Marine and Boating, Service, Repair, Work Orders. 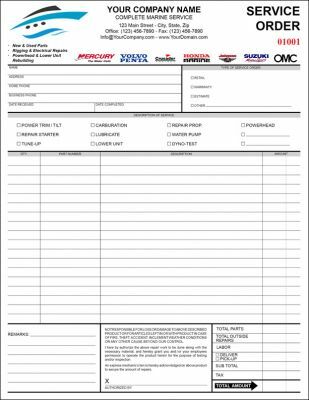 A Marine, boating service, work order and invoice fillable form, also perfect for sales, service & repair jobs. Our fill-in-the-blanks form simplifies everything - work write-ups and invoicing are a breeze and without the added expense of offset printing. Features checkboxes that make write-ups fast and easy. Editable terms ensures you're in compliance with regulations on every job.